we talked about King Agrippa. Thank you Marta for the facebook share. Southerners: I need your eyes. Pretty pretty please take pictures of church signs for me. that this is going to be a long post. but the main reason is that is makes so much sense. about the universe as well as mine does. harbor some of my fondest memories. 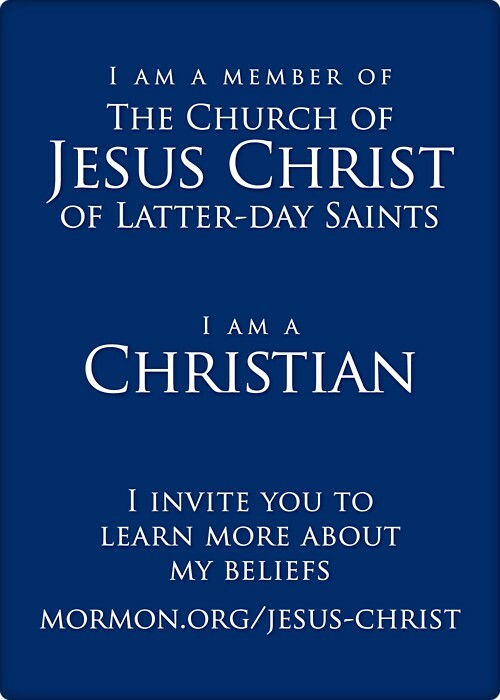 claims that we are an Un-Christian cult. (btw – this is not a new mindset. 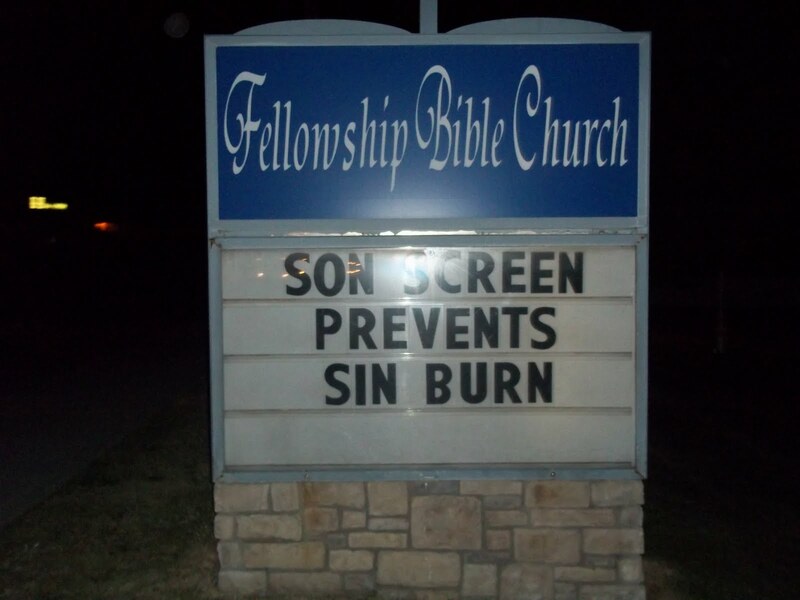 You know how I love the church sign. 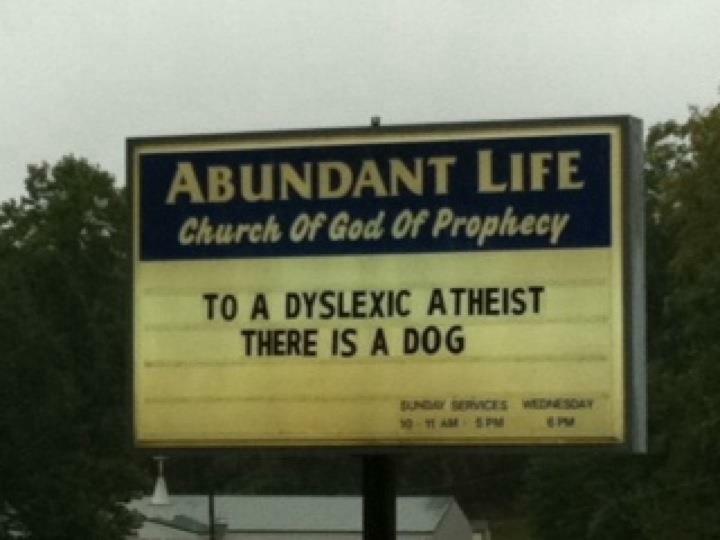 Here is another Baptist church sign. I was recently impressed with this news story in Knoxville. for reporting the Mormon side of the issue. so this story was emotional to me. in our claim that we are Christian. and closed minded Baptist preacher any day. Each of these stories were touching to me. for the past 8 years of my life. to be a true Christian. It’s not the first time that politics have brought attention to the church. and fell even more in love with the man. A while back I sent an e-mail to a friend about my beliefs. I kept feeling God nudging me to do so. It didn’t turn out so well. She got upset with me and I felt really bad. but I do try to follow the voice of God on a daily basis. how Christ was persecuted so why should we not be persecuted for His sake? that today receives more persecution than mine? It’s funny because in a way that is an even greater testimony builder for me. of my life a testament to Him. Here are some of the doctrines I love the most about my faith, straight from The Holy Bible. John 20:17 (Jesus and His Father are seperate) Jesus saith unto her, aTouch me not; for I am not yetbascended to my cFather: but go to my brethren, and say unto them, I ascend unto my dFather, and your Father; and to my God, and your God. Amos 3:7 (God designed a pattern of dealing with his children on earth by calling prophets if he is the same forever why would he change that?) Surely the Lord God will do nothing, abut he brevealeth hiscsecret unto his servants the dprophets. 1 Corinthians 15:29 (baptism for the dead – do you know any other church who practices it) Else what shall they do which are abaptized bfor the dead, if the dead crise not at all? why are they then baptized for the ddead? 1 Corinthians 15:40-41 (three degrees of glory compared to the sun moon and stars – any other church you know of talk about this) aThere are also celestial bodies, and bodies terrestrial: but the glory of the bcelestial is one, and the glory of the cterrestrial is another. There is one glory of the asun, and another glory of the moon, and another glory of the bstars: for one star cdiffereth fromanother star in dglory. Hebrews 5:5-6 (Do you know any other church that has the lesser priesthood Aaronic and the higher priesthood Melchizedek? )And no man taketh this ahonour unto himself, but he that isbcalled of God, as was cAaron. So also Christ glorified not himself to be made an high priest; but he that said unto him, Thou art my aSon, to day have I begotten thee. As he saith also in another place, Thou art a apriest bfor ever after the order of cMelchisedec. Malachi 4 (this talks about the prohet Elijah appearing to open the work of sealing – the hearts of the children turned to their fathers – sealings can only be performed in God’s temple – do you belong to a church with a temple? What if I told you that Elijah already appeared and that this work was already happening preparing the way for the Second Coming? You wouldn’t believe it because it is just way too spectacular, right?) Behold, I will asend you bElijah the prophet cbefore the coming of the dgreat and dreadful eday of the Lord:And he shall aturn the bheart of the cfathers to the dchildren, and the heart of the echildren to their fathers, lest I come and fsmitethe gearth with a hcurse. Here is another little ditty that has been in my filing cabinet for years. If it doesn’t get you thinking, I don’t know what will. I don’t know of any other church that has grown as fast. From 1 to 12 million members in 200 years. I don’t know of any other church that gives as much community service or humanitarian service. I don’t know any other church that has teenage kids that go to Bible study at 6 am on school days worldwide. I don’t know of any other church with 10’s of thousands of missionaries serving throughout the world at any given time. I know a whole lot of really good people (the best) who are members of my church. I don’t know of any other church that is completely run by unpaid volunteers. I don’t know of any other church that teaches self-reliance and emergency preparedness like mine. Our church welfare system is a-maz-ing. Heads of states and countries look to it as an ideal. Mormons are known for their focus on family and the strength of their families. How about that Mormon Tabernacle choir? Anyhow, that is probably enough for today. I could go on and on about all the great things about my church. I could sit here for weeks and talk scripture and philosophy, but if I know one thing it is that when it comes to God, nothing can teach a person better than the Holy Ghost. He testifies of all truth. So I will leave you with the testimony that I have gained through the power of The Holy Ghost. I have prayed, fasted, and studied diligently to receive answers from God, ever since I was a kid. My testimony is a culmination of my life’s efforts and with this I will leave you. when Christ himself was crucified and all of his original apostles were murdered. in a grove of trees in upstate New York in 1820.
because as prophesied they all draw close with their hearts but not with their hearts. and modern day prophets have been on the earth ever since then. and try to change my actions according to the counsel that they give. They are truly inspired leaders and testify of Christ in word and deed. because my religion is true. The Holy Ghost testifies this to me repeatedly. and takes nothing from the Bible but adds to it. that I have tried to build my life on the rock, who is Christ. to know that additional revelation is needed for clarification. after they’ve lost a loved one. Most of all, I believe in Christ. He is my King. He is my Jesus. He lives. He is my best friend. by giving His own life. in the Garden of Gethsemane. He suffered so I don’t have to. in this mortal life and in the immortal life to come. 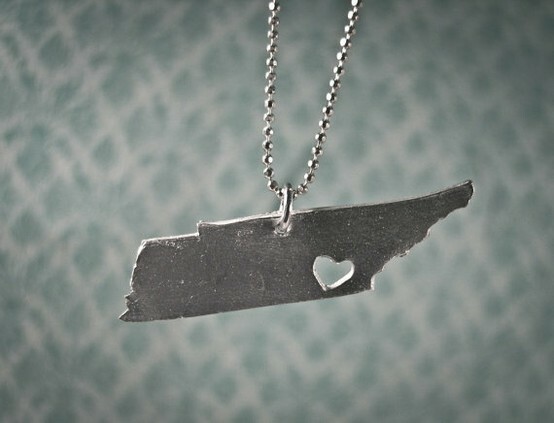 There are so many things I miss about the South. and the familiar faces there. I am white trash and I can’t be burned. I have admitted it before. I teach my kids about it. I get all giddy inside when I find reasons to think I am not as white trash as I thought. I have bragged about embracing it. Thanks to all ya’ll in the South, who helped me get there. However, being white trash does not make me void of feelings. It does not make give me permission to not try and be a better wife. It does not make me NOT want for more out of myself. It certainly doesn’t make me unloved. So, if I am white trash, so be it. because you think it’s the most hurtful thing you can say. First of all, you have to do better than that. And second, I just want you to know one thing. I know that God knows what you do and you will one day have to answer to Him. Therefore, I don’t have to worry about it. I love it when I have a church sign that is perfect for the moment. therefore I cannot be burned. When you sit at your computer and spew forth vial insults anonymously, do you know what it says about you? You are a coward and you have issues. Why are you obsessing over me? 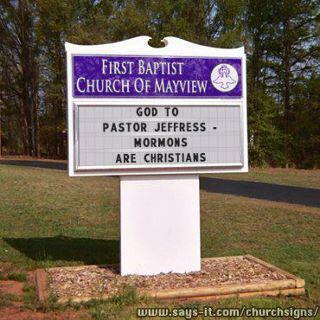 And why do you feel it justified to kick any of God’s children, even if they are Mormon. 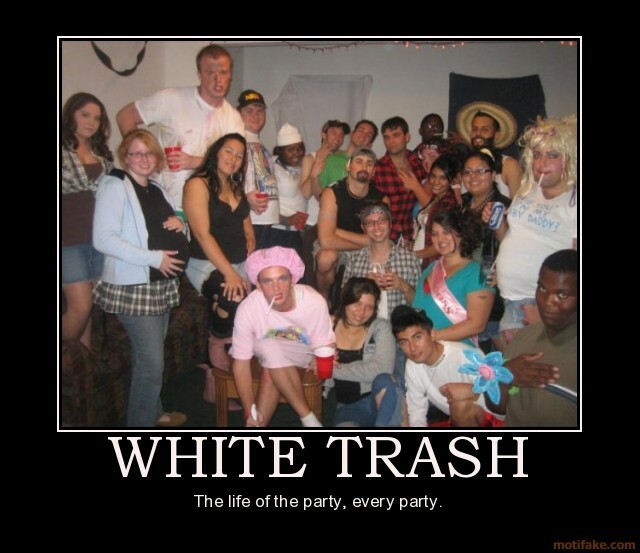 I would be white trash any given day over mean and hateful. White trash people are some of the best people I know. It’s the people who don’t admit their trashy parts that I worry about. And the people who go around pointing fingers at other people for being trashy are especially special. I poke fun. I speak my mind. I have opinions, sometimes they are wrong. Gratefully, there are people out there who have the guts to take it up with me in person because when they correct me in love (often on my blog) I often find myself wanting to change. And I am grateful when I see the error in my ways because this life is really just one big chance to improve really. Deep inside I love people, I really do. And that is why people love me in return. I will try my darndest to understand you and I will find a reason to love you. Sorry for the rant today, my readers who come over for some funny, but it was merited and anonymous put me in bad mood which reflects on my writing. Go ahead everyone, feel free to stand with me and admit just one part of your trashy selves. My baby is walking around in a onsie that is covered in brown make-up stains. I put it on her after getting it out of her drawer that way. I told her to just go ahead and fold her bras and underwear as nobody is gonna see the stains on her underwear. I hope I will remember to tell her to wear the unstained ones next time she has a doctor’s appointment. Oh, and if you happened to miss all the excitement and are wondering why the heck I am freaking out, make sure you read each and every comment by anonymous on this popular post. for a little piece of heaven. All the way from Tennessee to Utah. LG doesn’t understand why I think this guy is funny, but he couldn’t hide his chuckle at The Eye of the Tiger. 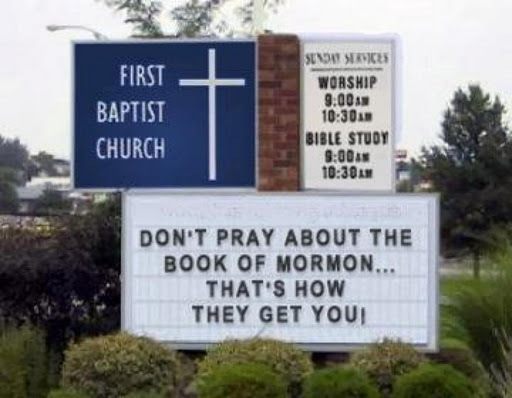 Lots of Mormons are funny. I recently learned of this funny guy Shaycarl on youtube. He’s a Mormon. He’s kind of obnoxious. He has four kids. He lives online. Wow, it’s like we are long lost twins. Except he is famous and makes his living on youtube and I am only known by my 800 friends on facebook (and only 1/8th of them read my blog) and I don’t make any money. But, it’s all good, I blog for me. And it’s always flattering that anyone actually reads this thing. 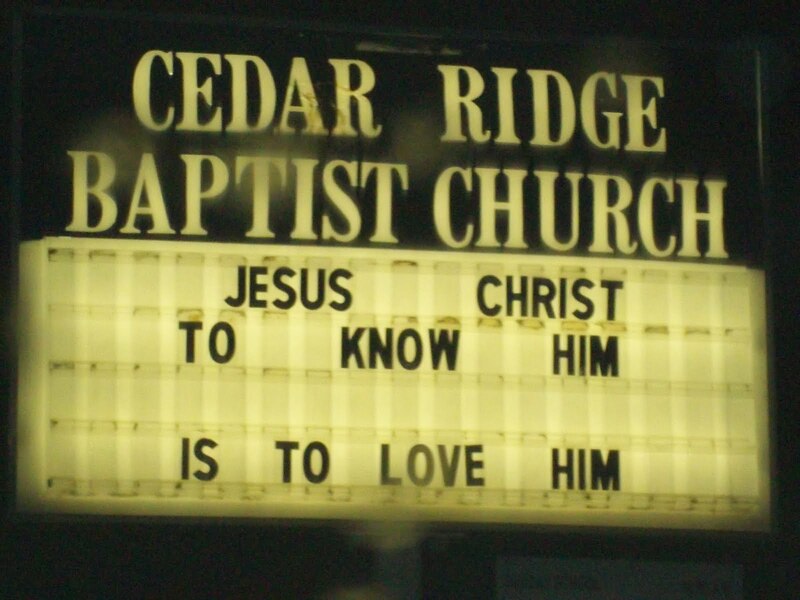 Well, you know how I love my church signs. You also know how I love a good laugh. And you know how I get giddy when we combine the two. If you are with me, you must check the link below. 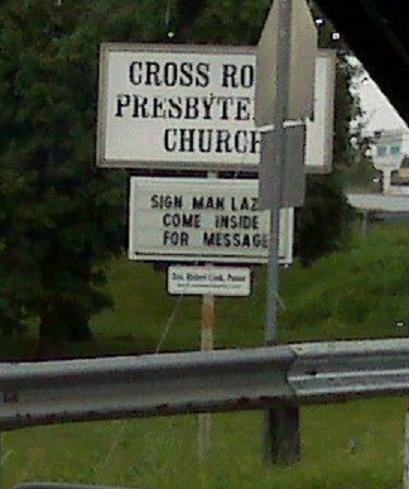 It is a great church sign war. And I believe the funny Catholics won. I think that I agree with the Catholics, and not only because they are funny. Rocks will be in heaven because heaven will be here on earth. Why would the rocks have any need to go anywhere else? 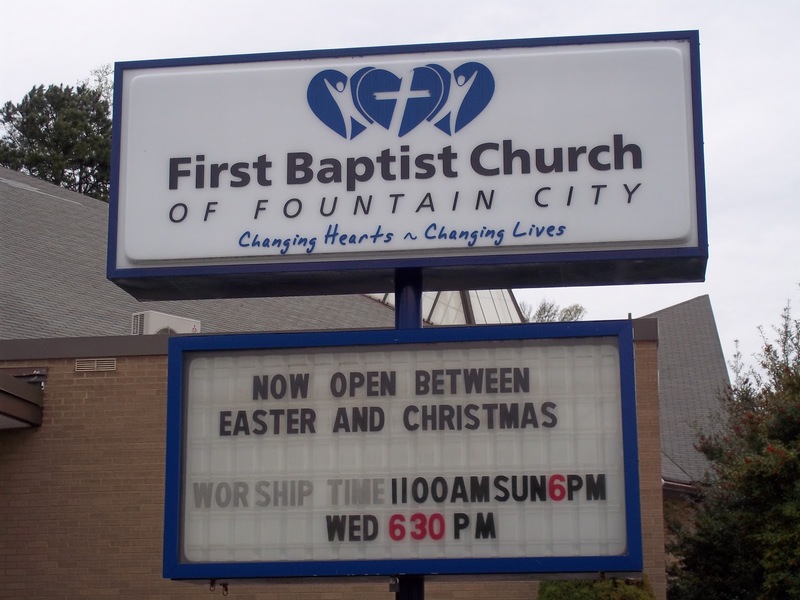 I was thrilled when I discovered this little Baptist church down the street. It made me feel right at home. but I will take what I can get. 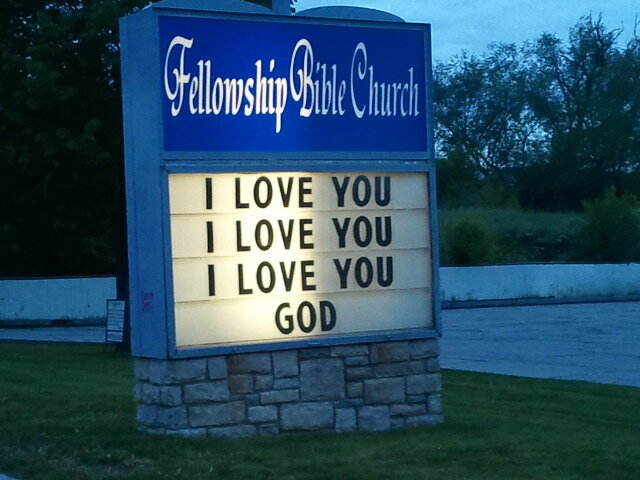 Do you think that this sign is saying I love you God three times? Or is it God saying he loves us three times? for the Mormons and the Baptists. And He loves all of us. I sure do miss my Southern friends. Especially on Sundays. I was asked to write a poem about mothers. I am not sure what is going to be done with the poem. It’s not my greatest work. It’s for my church back in Tennessee. I didn’t have a lot of time, and I really have to be in the mood for poetry. I hope that somehow my main feeling is communicated: I have been mothered by many many women. Some are really my moms and some were friends and some were total strangers. I will never forget the day that I left the local library bawling. That morning I had just received some shocking and awful news. I decided to take the kids to the library to get my mind off of things. Of course, my two children had other ideas. My baby was a monster that day. They say that our small children respond to our emotions, and I think she was responding perfectly. A man came across the library and pretty much told me I was an awful mother. It was the straw that broke the momma’s back. I gathered the monster, her sister, and tried my best to keep it together until I got outside. I broke halfway to the door. Do you know that it is six years later and I am still dealing with this major trial in my life. And often, very often I hear the words to that prayer and feel at peace. I wish I could somehow tell that mother, wherever she is, that she has been an angel in my life. 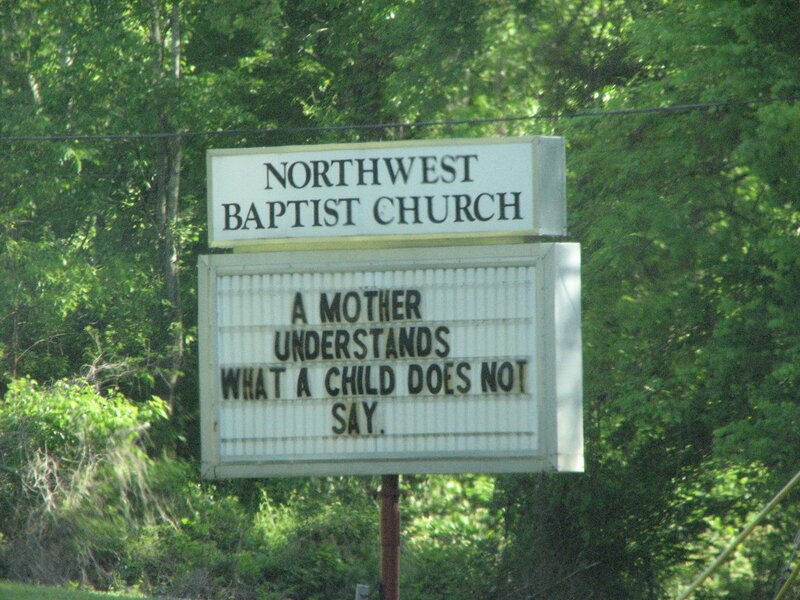 But really, aren’t all mothers angels? I think God gets so much of his work done through women with mother hearts. How grateful I am to be one who can succor and to also be one who is succored. They give birth to babies. Cradle, not just their own. It’s too big to be alone. Or have never housed a full womb. And cry over grave and tomb. They can’t help but help them grow. They love one and all. Because they can’t help it. They know peace is their call. To get me through each day. And cure me when I’m down. They are women who I love. God, to me, did send. Kneel in His eternal throngs. In lives old and new. Because they know how to love. And succor me and you. Each person on the earth. All good things start with them. Without them, where’s our worth? 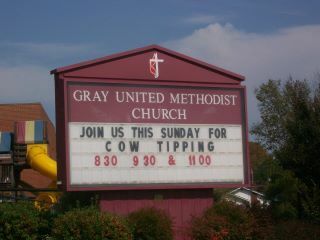 Oh how I am going to miss the good church signs of Knoxville. Chantay has promised me to e-mail the good ones to me. I thought that was so sweet. It made me cry. I think I will cry every time I get an e-mail. For now, I stocked up on some before we left K-town, so stay tuned. I thought this one pretty funny.